Fruit trees are sometimes grown for the floral beauty they display in the spring as well as for the fruit they produce later in the year. Annual pruning, regular watering and occasional fertilizing are necessary to maintain the health of fruit trees. It is important to understand what fertilizer is, how it works and when it is needed, before choosing one and applying it. Too much of the wrong nutrients could diminish your blossoms and fruit. Soil can become depleted of its natural nutrients. Some soil, because of its composition, lacks nutrients to grow certain types of plants. Fertilizer is a means of adding those nutrients back into the soil to sustain plant growth. Fruit trees do not generally require a special fertilizer. Under normal circumstances, a general fertilizer that provides nitrogen, phosphorus and potassium is usually sufficient. Before you begin fertilizing fruit trees or the site where you intend to plant them, it is wise to get a soil test. The test can be done by most local extension offices and can provide invaluable information. Some of the data provided will include the pH of your soil, which is critical for some fruit trees; the nutrient deficiency report and recommendations for correct those deficiencies in relation to the type of fruit trees you want to plant. To give young trees the best start, remove all the weeds and competing vegetation. Then, add the fertilizer recommended by the soil test and work it into the soil a good 4 to 6 inches deep. Add any other soil amendments needed, such as organic matter to break up compacted soil. Signs that fertilizer might be needed include poor annual growth. 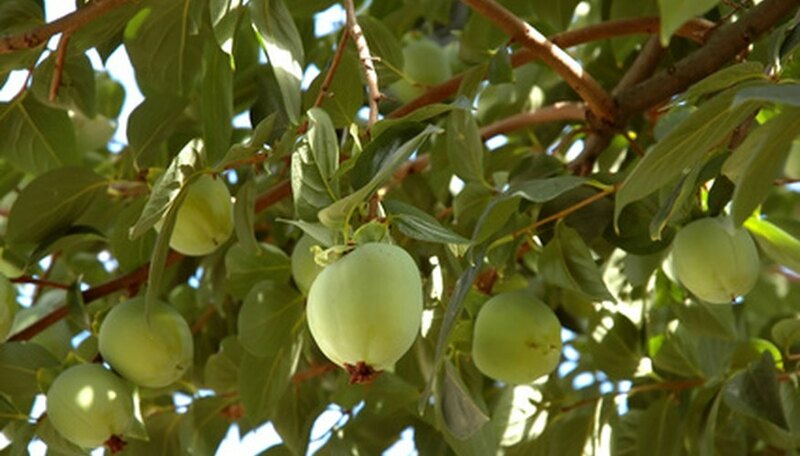 Most fruit trees grow 12 to 18 inches per year until they reach maturity. Poor leaf or fruit development could be another sign the tree needs fertilizer. Conduct another soil to determine which nutrients are lacking. Choosing the wrong fertilizer can create different problems without fixing the original problem. If you cannot do a soil test, apply a band of 10-10-10 fertilizer around the tree, under its canopy, about 18 inches away from the trunk. Once the trees are planted, fruit trees should not need fertilizer, especially if the soil was properly prepared before planting. Depending on your preference, commercial fertilizer may not be an option. Organically grown fruits need organic fertilizers to maintain their organic standing. Organic fertilizers are those that come from living or once-living things, and include animal manure, dried leaves, grass clippings, compost and straw. These do not add manufactured chemicals to the soil, but they take longer to break down and provide nutrients to the trees. It is also more difficult to gauge the nutritional content of these types of fertilizers. Though organic fertilizers are less expensive, inorganic fertilizers give you more control. You can tell the exact content of each nutrient you are applying and know it will get to the tree quickly. They are also easier to apply.